The Europeans are used to it. The Germans are paying US$6.37 a gallon (â‚¬1.31/L), and the Belgians $6.76 a gallon (â‚¬1.39/L). The Norwegians shell out $7.45 a gallon (â‚¬1.53/L), an incredibly high price considering their country produces and exports petroleum. But Venezuelans pay only US$0.12 per gallon thanks to a huge government subsidy. In Caracas, filling up the 19-gallon tank of a 1976 Chevy Nova will set you back $2.30. 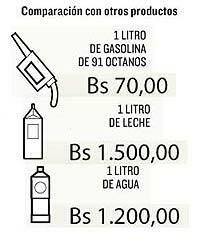 Yet a litre of milk costs 1,500 Bolivars, or US$2.65 per gallon. Bottled water is just as expensive, at 1,200 Bolivars, or $2.12 per gallon. European gasoline (petroleum) prices at AAIreland’s AARoadwatch. U.S. prices at Energy Information Administration. Want to learn about drilling? Try the World Oil magazine.